This is a wonderful craft for kids who like to get messy. If you have a toddler who doesn't like finger painting then you shouldn't attempt this project *grin*. This isn't just a tulip as you can plainly see. I made it with my hand which God made a part of me. I hope you have a very, special Mother's Day! if doing it with a secular group (school, etc) substitute "which is a part of me" for "which God made a part of me"
Dip the forearm (from elbow to wrist) in green finger paint. 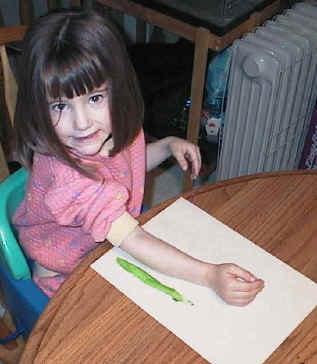 If you don't have a tray big enough to accommodate this, just paint the finger paint onto the forearm with a paintbrush. 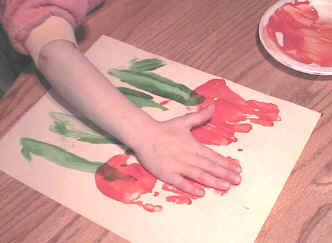 Now dip the hand (excluding the thumb) into red finger paint and stamp on top of the stems (holding the thumb up) to make the tulip flowers. Keep the fingers close together. You can add fingerprint green stems, thumbprint green grass, thumbprint caterpillars and thumbprint butterflies. See the fingerprint crafts section for ideas on how to make a variety of additions.